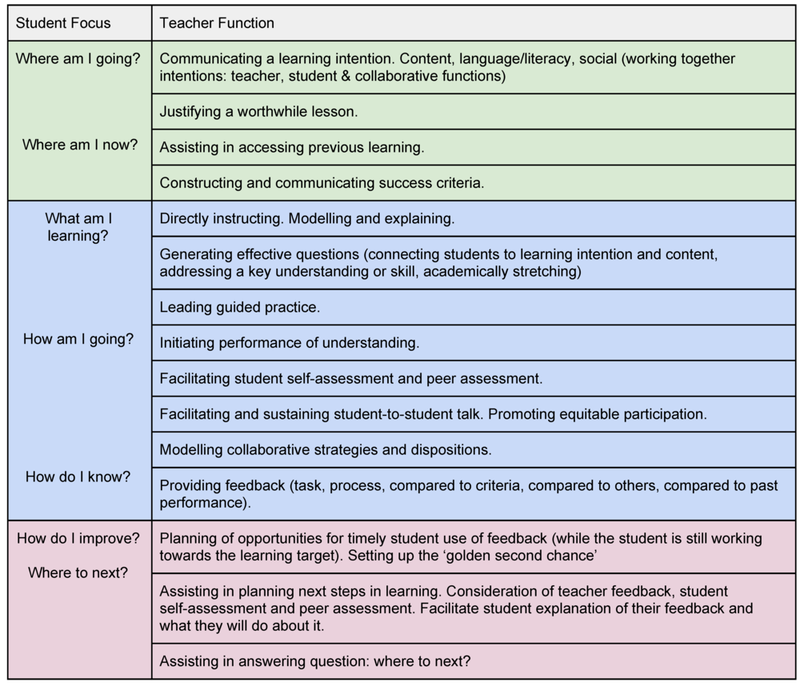 A focus on student focus and teacher function, promotes student collaboration. Classrooms are set up to ensure that students work in teams. Teachers talk less to the whole class and more to groups of students. Students know that when a teacher moves to work with another team, they have a responsibility to keep working so that other students have access to the teacher’s work. Class surveys show that the large majority of students want other students to show regard for the work of students and teachers and not interrupt or diminish learning. An understanding of the many functions performed by teachers and students gives access to a far more effective teaching and learning model. It promotes self-regulation, regard for the learning of others, and ultimately true collaboration. A focus on the classroom as the main site of student learning and assessment, and of teacher work, makes it essential that collaboration and teamwork are promoted and developed. Summative tasks (tests and assignments) are minimised in the junior school and lessons are planned to maximise student opportunity to contribute to decisions about next steps in learning. Students are taught to recognise quality work, recognise the gap (if any) between their work and exemplar work, and plan next step work to close the gap. The notion of ‘beating’ other students in summative assessments is replaced by a goal of working together, progressing together and helping each other whenever possible.